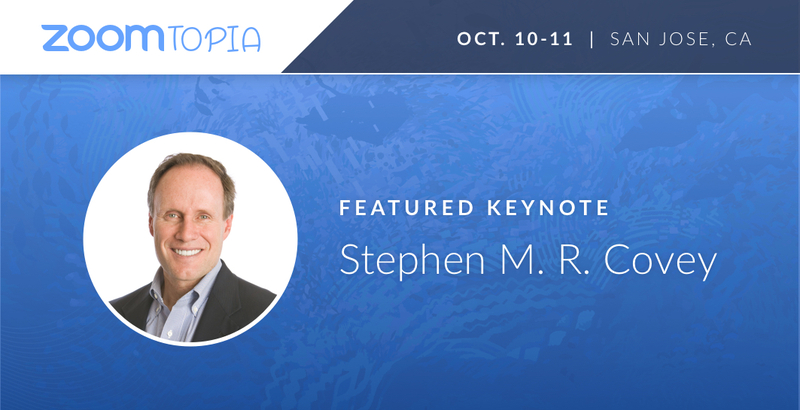 As we build out our speaker line-up for Zoomtopia, we will highlight some favorites in this blog. Who better to start with than Stephen M. R. Covey? Covey’s work is central to the theme of this year’s Zoomtopia: the importance of trust, relationship-building, and culture in business, as well as the impact of video on these areas. Covey is a co-founder of CoveyLink and the FranklinCovey Global Speed of Trust Practice. He is the New York Times and number one Wall Street Journal best-selling author of The Speed of Trust, a groundbreaking, paradigm-shifting book that challenges our age-old assumption that trust is merely a soft, social virtue and instead demonstrates that it is a hard-edged economic driver—a learnable, measurable skill that makes organizations more profitable, people more promotable, and relationships more energizing. He advocates that nothing is as fast as the speed of trust and that the ability to establish, grow, extend, and restore trust with all stakeholders is the critical leadership competency of the new global economy. Covey is the former CEO of Covey Leadership Center, which, under his stewardship, became the largest leadership development company in the world. Covey, along with Greg Link, led the strategy that propelled his father’s book, Dr. Stephen R. Covey’s The 7 Habits of Highly Effective People, to be one of the two most influential business books of the twentieth century, according to CEO Magazine. A Harvard MBA, he joined Covey Leadership Center as a Client Developer and later became National Sales Manager and then President and CEO. Under Covey’s direction, the company grew rapidly and profitably, achieving Inc. 500 status. As President and CEO, he nearly doubled revenues to over $110 million, while increasing profits twelvefold. During that period, both customer and employee trust reached new highs and the company expanded throughout the world into more than 40 countries. The company was valued at only $2.4 million when Covey was named CEO, and, within three years, he grew shareholder value to $160 million in a merger he orchestrated with Franklin Quest to form FranklinCovey.